I generally take the view that search engine algorithms are written to approximate human perception of relevance. They are also structured in such a way as to apply value to their ranking factors based on generalisations of human behaviour. In theory, a website that better reflects human behaviour will be one that receives better search engine rankings. No one is going to argue that link building is not a massive part of any SEO campaign (OK, some people will…). You need links to increase authority, you need links to build PageRank, and for many industries they’re not easy to come by, so you get webmasters of relevant sites to put a text link to your site on theirs. I’ve heard that on occasions money can change hands to cover any costs incurred, but that’s a debate for another day. When an SEO person requests a link, they will generally specify the anchor text that they want to be used to link to the relevant page. 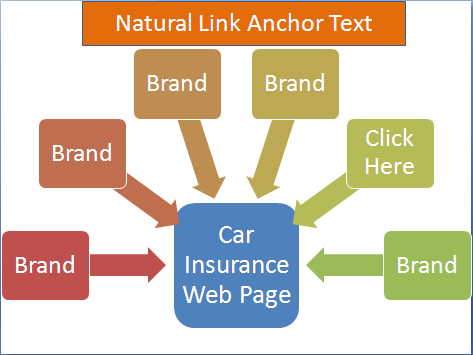 This is because, as everyone knows, a link that uses descriptive anchor text is better for SEO, and will help your site to rank for your chosen keyword, and make you pots of cash. As an SEO, you’d be really proud of your great work in getting loads of (in this case 6) amazingly relevant links, and you’d expect to see some great improvements in ranking off the back of them. This method seems to totally ignore the way that real people behave when sharing content. If you go back 5 years or so, the barrier to entry to publishing on the web was much higher than today. Before Facebook or Twitter, you needed to have a website, which meant you needed to know some HTML, which meant that you were fairly web savvy, which in turn meant that you would probably have heard of accessibility, and would use reasonably helpful anchor text for links. You would also probably link from a web page that contained all your other “useful resources”. Under a paradigm where links are predominantly given by real people rather than incentivised web masters, the distribution of anchor text that is used is significantly different from that which we would choose our selves. That’s hugely important, because if we also believe that the search engines are basing their relevance on the behavioural norms of “now”, a site that is adhering to the old ways of linking will quickly become obsolete from a user centric set of algorithmic rules, and be consigned to the lower reaches – because it is no longer demonstrably relevant to the users it is purporting to target. If you come at this from the Vince Update angle that Google rewards brands, then the value of branded links is underlined, in red ink. A quick note on internal anchor text. This is the area that you have complete control over, and this does need to remain relevant to pages that are being linked to. I agree with this for links to the home page and I’ve even see this weird effect where an exact match anchor text link will cause a ranking boost for that term but slight drops for a few other very related, but not exact match terms. Link was in a guest blog post too on at least vaguely related site, not some BS “resources” page. But what about internal pages? I would think an internal page should get more descriptive anchor text. Thoughts? Amen! And well put. I think it was SMX advanced 2 yrs ago when I came back to the office and held a meeting… ‘we’re not keyword stuffing our anchor texts anymore’ One of my link buddies said they flipped it on it’s ear 80% of keyword anchor text was gone (they still used it a little – because that looks natural) My jaw dropped when I heard that they were going after ‘click here’ for most of their clients!